This is a wonderful, uplifting and spirit-raising compilation of hits from the late sixties/early seventies. 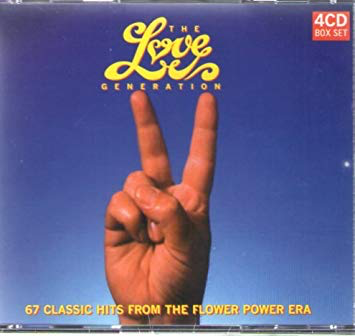 The title of "flower power" hits is a little bit of a misnomer, as they are not all peace and love-inspired songs man, but they all cover that carefree period. Basically, they are pretty much excellent examples of rock, blues rock, country rock and sometimes folky music from a period of superb creativity and atmosphere. There are are some interesting songs across the collection's four CDs, and while they are not copper-bottomed rarities, as such, there are some long-forgotten numbers that I enjoy listening to again when I give this a whirl. Examples are "Incense And Peppermints" by Strawberry Alarm Clock, "Green Tambourine" by Lemon Pipers (A song I remember my parents had as a single when I was around eight, it brings back nice memories), "My Friend The Sun" by Family and "Up, Up And Away" by the 5th Dimension. The sound quality is generally very good, although it is dependent on the original recording. What is also important is that all the songs are the originals, something that is not always the case on sixties compilations. Personal favourites are the blatantly Dylanesque "Catch The Wind" by Donovan; the anti-war anthem "Eve Of Destruction" by Barry McGuire; "Everlasting Love" by Love Affair, with Steve Ellis's marvellous lead vocal; "Silence Is Golden" by The Tremeloes; Pentangle's quirky folk of "Light Flight"; "The Band's "The Weight" and Peter Sarstedt's evocative "Where Do You Go To My Lovely". Also, one can't help but like the hippy-ish nonsense of "Good Morning Starshine" by Oliver, "Aquarius" by the 5th Dimension and Scott Mackenzie's iconic "San Francisco". There is also some great rock to be found on here in the shape of "Devil's Answer" by Atomic Rooster, "On The Road Again" by Canned Heat, "American Woman" by Guess Who and "Paranoid" by Black Sabbath. Check out Melanie's wonderful cover of The Rolling Stones' "Ruby Tuesday" too. I have always found Keith West's "Excerpt From A Teenage Opera" to be very odd, however. There are too many great songs to praise them all. Here is the full track listing. All simply great stuff. Get hold of this compilation if you can.